Many different types of bacteria can grow on animal products. It’s important to safely handle and store all types of meat. However, many people find it confusing that different types of meat have different handling rules. It may be perfectly safe to eat one type of meat a week after it was prepared or freeze it to eat later. However, other types should be thrown away after only a few days or kept unfrozen. Do not buy foods past “sell-by” or expiration dates. 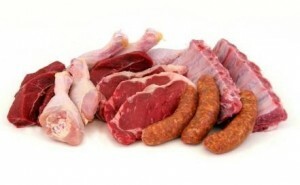 Place raw meat and poultry in plastic bags so meat juices cannot cross-contaminate other foods. Place securely wrapped packages of raw meat, poultry, or fish in the meat drawer or coldest section of your refrigerator. Cook or freeze fresh poultry, fish, ground meats, and organ meats within 2 days; other beef, veal, lamb, or pork within 3 to 5 days.